Happy New Gardening Year ! The propagator is now switched on, and is incubating about 150 seeds... and it feels so good to be growing things again. My new propagator is the size of Australia and I hope, just as hot ! I guess I should have given a short speech before switching it on, then cut through some garden twine with beribboned secateurs , but in reality I just gave a silent thanks to the deities of the earth , that it is time to kickstart the new season. Because the seed compost is kept in the greenhouse, I knew it would be very cold, so I filled all the seed trays and pots, before leaving them in the propagator for 24 hours to warm up. Whereas my old propagator is large enough for one seed tray, my new one can handle three seed trays (one large and two small) and some pots too. This means that lots of different seeds can be simmering away in there, instead of forming an orderly queue and waiting their turn. I wanted to choose seeds of plants which need a long growing season, and would benefit from this early sowing. Coleus were my first choice as they take a long time to reach a good size, but, boy, are they worth waiting for. For some reason they seem to have have fallen out of favour with a lot of gardeners, and are viewed as dot bedding plants. We love them for the sub tropical garden where they add colour and texture with their infinite variety of shade and pattern. I grow them every year and then donate them to the Exotic Gardener to plant out as he wishes. Every year we agonise over them for weeks and weeks as they remain stubbornly microscopic until August when they suddenly have a growth spurt and overnight become quite statuesque. I don't know whether they perform this way for everyone or just for us, but I thought I would try and outwit them by planting them early. This way, they will hopefully sulk in June and flourish in July. They prefer to be sown on the surface of the compost and have access to light. Don't sneeze when you are sowing them as they are teeny ! I also sowed Datura 'Double Golden Queen' after soaking the seeds for 24 hours. I chose this variety as I hope they will hold their heads up, rather than hanging them in shame. I have grown Datura before and have had reasonable rates of germination, but always been disappointed with the results, as flowers have been few and downward facing. Ricinus Communis Impala was my next choice. Beautiful seeds, a little like mottled bean seeds, but never ever mix them up as Ricinus is extremely poisonous. Another one which will benefit from a long growing season, although they do grow like triffids anyway. Sown early, then coddled in the greenhouse, should hopefully result in very well grown, dramatic plants to plant out in the sub tropical garden, once all fear of frost is over. Dahlia 'Bishop's Children' and Dahlia Giant Hybrids will hopefully flower earlier from this early sowing. I grow Bishop's Children every year and wouldn't be without them. The Giant Hybrids are an unknown quantity and I am interested to see what will emerge. Again all the young plants will be kept under heat initially, then moved to a cool, frost free greenhouse, before being planted out mid May. If you read my last post 'Yes, we have no bananas ...' you may remember that I was musing on Musa and wondering which bananas to grow from seed. I ordered a variety from Jungle Seeds, and I am under no illusions at all, fully aware that I may get no germination at all, or, at best, low success rates. What the heck, it will be fun trying! 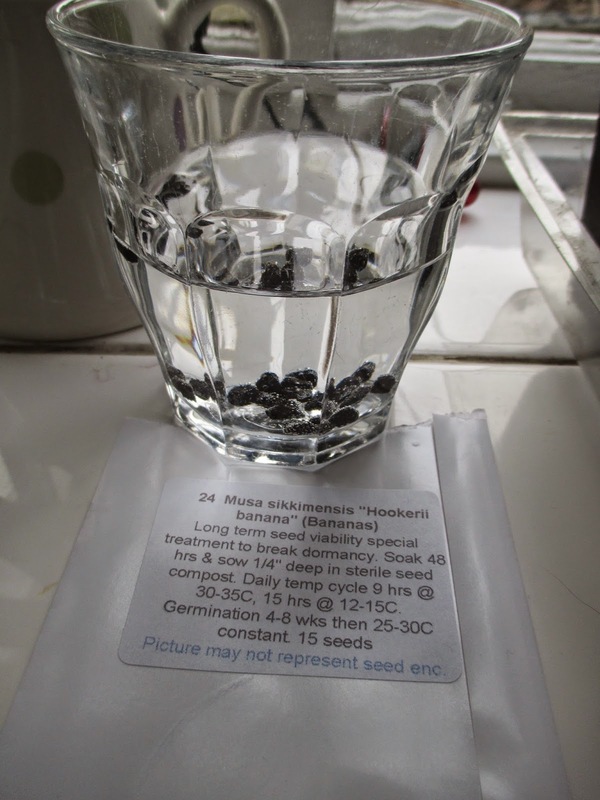 I soaked all seeds for 48 hours in warm water as suggested in the sowing instructions, and before sowing them in little pots, used a nail brush to roughen the seed coat . 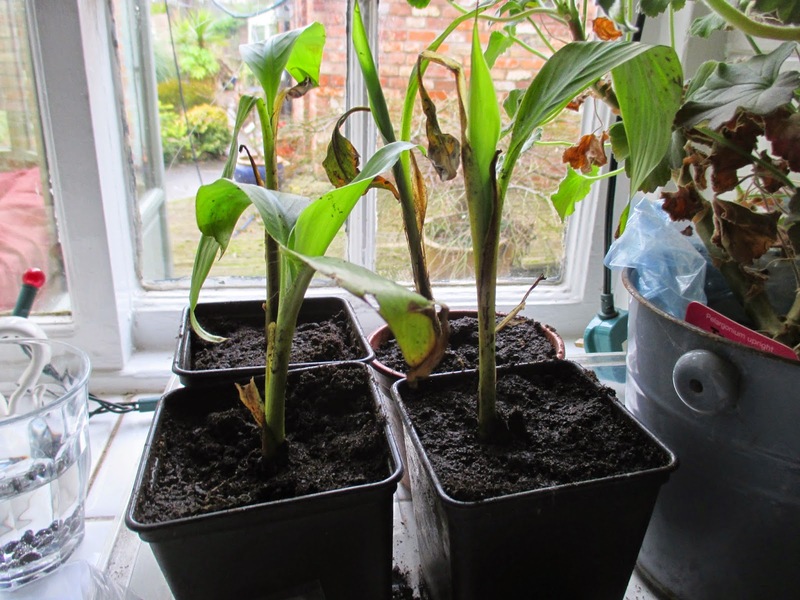 I learned in my last post, from members of 'Hardy Tropicals UK' that germination is encouraged by fluctuation in temperatures in bananas (Musa), and the optimum way to do this is to take them out of the propagator for night time and put them back in through the day. Ensete, I believe, do not need this fluctuation, but need a constant temperature for germination. Even given the fluctuating temperatures germination can take weeks or even months. Love the Banana plants! I chuckled when I read the bit about the new propagator being the size of Australia! I agree--starting off the new growing season is a thrill! Hi Plantpostings, the excitement begins ...!! Oh you are off the starting block then Jane :) A wonderful feeling. Half term always used to be when I made my first sowings when I was working. I'm growing less from seed this year but your post is a most useful reminder that I've got some ricinus seeds in my seed box so must get myself into gear soon! Hi Anna, yes I take February half term as the starting point, and I am still working so it is a good point to kick it all off. I was reading, however, on Hardy tropicals that some people feel this is too early to sow Ricinus as they can get get leggy in low light levels. I am aware of this so will give them as much as possible. That looks like a serious propagator! I envy you. Good luck, especially with the banana. 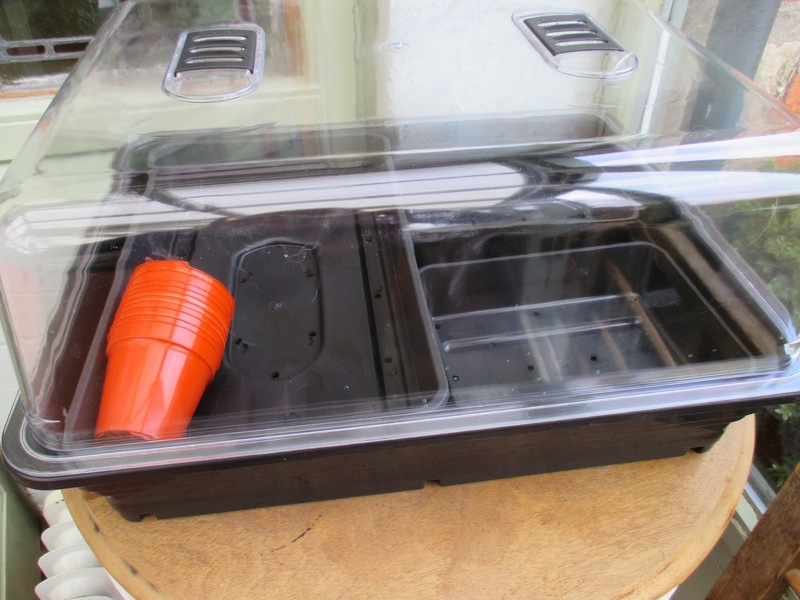 Hi Alain, it is a grown up propagator ! At long last! I can totally understand your propagator being the size of Australia. It is hard to stop planting once you start or am I the only one with no self control? Hi Susan, you are not alone! I propagate like a member of the Olympic Team, then have nowhere to plant the results ! Hi Jo, I will pop over and have a read ! 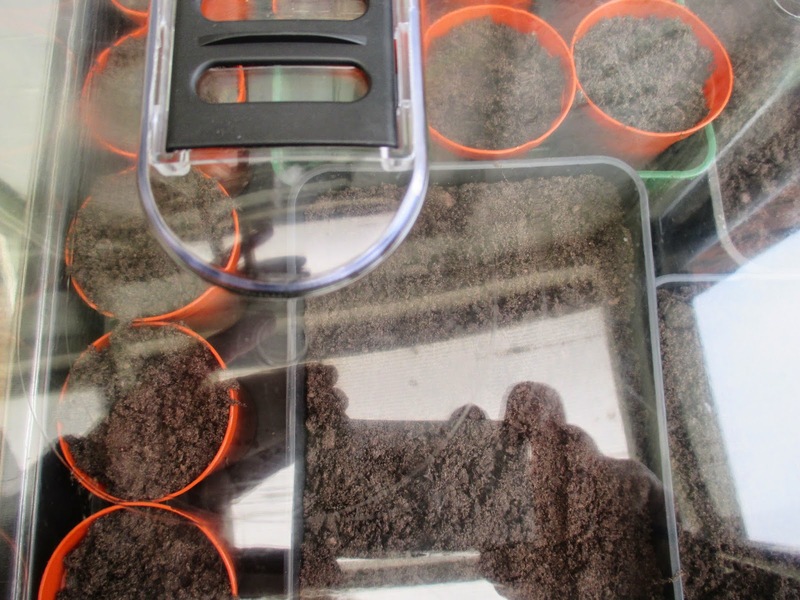 I do like the windowsill propagators as it means you can make the most of every available space ! Well done you are off to a good start, It makes me feel that I had better get going. I have so many packets of seeds that I am a bit daunted. I am very interested to hear about your banana seed experiment. Good luck with it. Hi Chloris, I am not filled with confidence about the bananas but am enjoying having a go! I think there is a real skill to getting them to germinate from what I read. Good luck with your seed sowing! I know what you mean about being daunted, it is a real juggling act to get them all going while tending the seedlings too. I just run out of space! Wow, I have no idea on growing banana using seeds. Here, we grow banana from shoot that bear up from the base of stem. I like your coleus collection. I always fail on sowing coleus seeds, so I grow it by cutting. Happy gardening! Hi Endah, I would propagate bananas that way if I could! 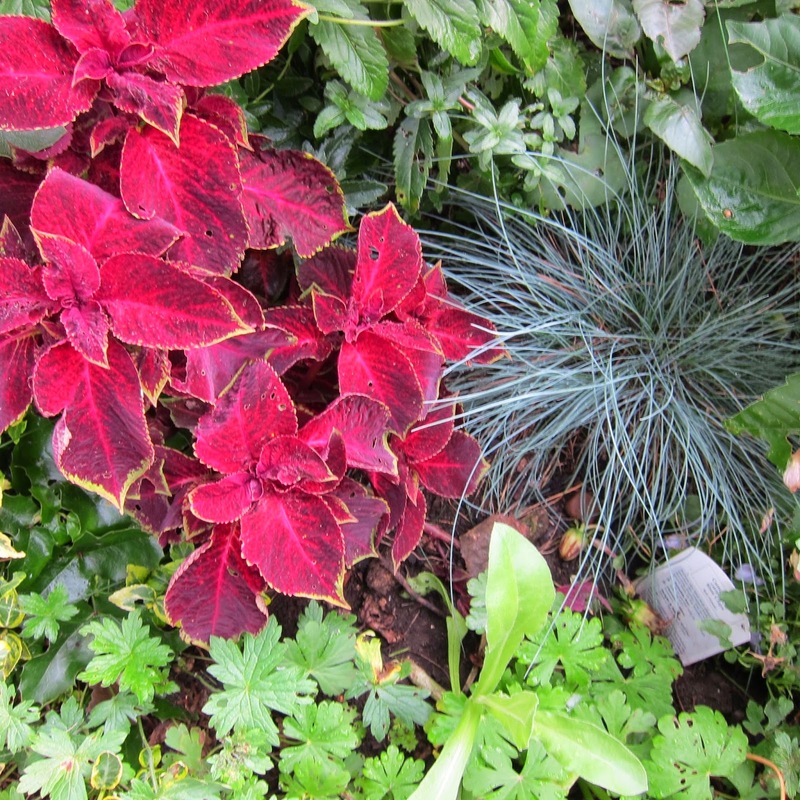 Coleus are fairly easy if you just sprinkle the seed on the surface of the compost and don't cover it. Also, giving full access to light stimulates germination too. A good idea to warm up the compost, I look forward to seeing how those bananas grow. Hi Sue,I hope they appreciate a bit of coddling and show their appreciation by germinating !! Hi Jane, How exciting! Thinking tropical......You're encouraging me to research when I need to start my seeds......too early here but it's coming up fast! I'm looking forward to pictures and updates on the tropical garden. Happy Gardening! I think I am a bit early actually and I may regret my decision to get sowing! All my dahlias are through already, so I am having to put them in the conservatory all day to benefit from the light, then move them into the kitchen for the night, to eep them warm!! I have made a rod for my own back! We still have over a foot of snow and spring seems a long way off, so I have not given much thought yet to seeds. One more month and hopefully I will be able to get sowing. I hope you have better luck than I did with coleus. Mine were tiny for ages, and unlike you late summer experience of a growth spurt, never did prosper. The bananas will be interesting and look forward to updates. oh boy, that propagator looks wonderful. Room for everyone! Great idea warming the soil first. I've never thought of this but will do now. Had no idea coleus was falling out of favour. 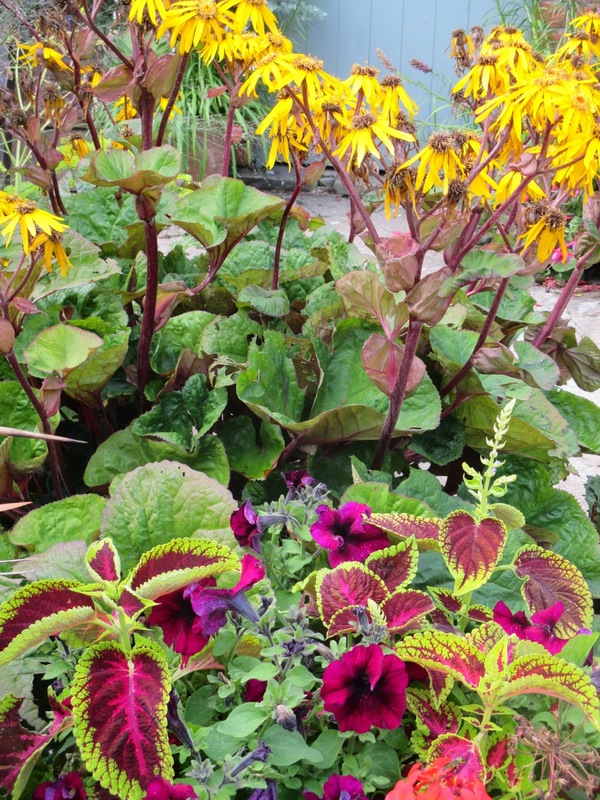 It adds a great splash of colour in otherwise dreary spots and I love it in containers. Too bad for other people I guess, I'll keep on planting it. 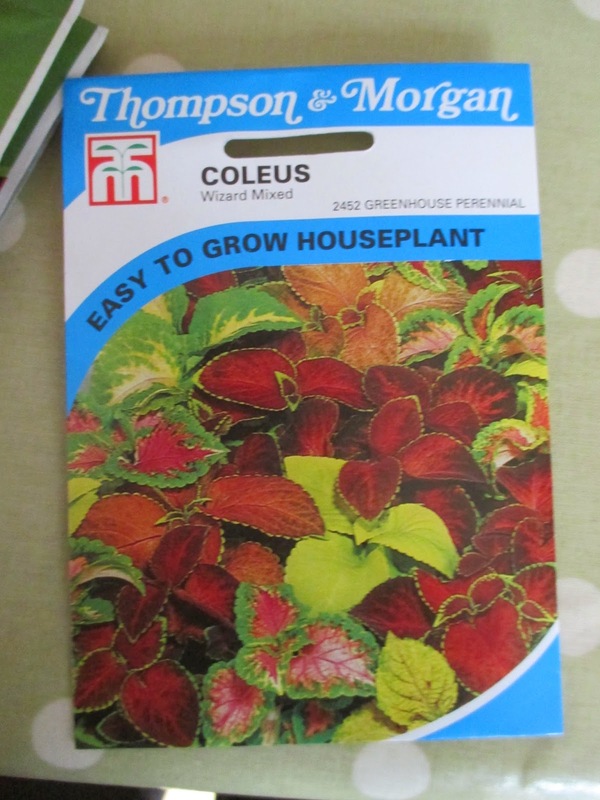 Hi Margeurite, I'll keep on growing Coleus too ! I love it and it doesn't care whether it is fashionable or not! I love that every plant is different. I love the way you describe your plants as 'simmering away' in your propagator. I'm growing dahlias from seed for the first time so if there are any tricks, please let me know! Coleus grow like mad here in our heat/humidity and are very popular here. They are very easy to propagate from cuttings. 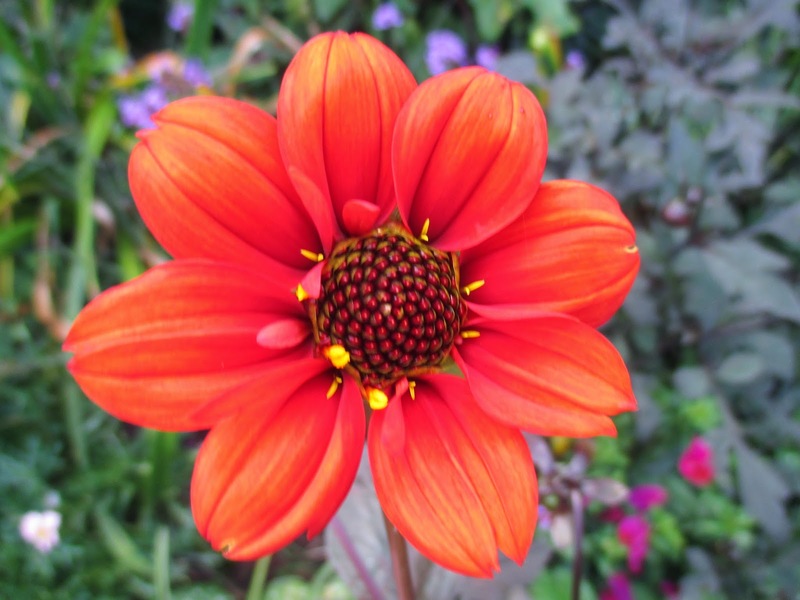 No tricks to Dahlias as far as I know Tammy! Mine seem to germinate very readily ! Hope yours do the same ! Wish I could take coleus cuttings - it would be so much easier ! !